SOUTHINGTON - Practice had barely begun, but Jacob Drena wanted to make sure the players around him knew what kind of day it had to be. It wasn’t loud or boisterous, just stated as a matter of fact. It was the final practice leading up to the final preseason game, but Drena and the other upperclassmen on the Southington football team wanted to make sure it was treated as a meaningful one. For the Blue Knights, it’s about setting the tone for the upcoming year, preseason game or not. Expectations are high and with good reason. For the first time since 2011, Southington enters the season in a unique position - having missed the postseason. But a new season has brought with it a new focus. 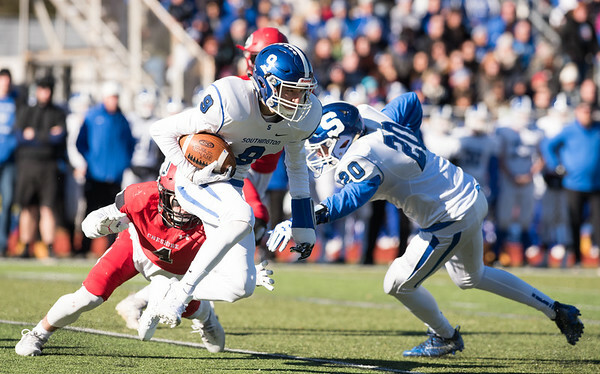 And while there has been plenty of turnover on the Blue Knights’ roster, Southington’s sights remain on finishing as the best team in Class LL. Players such as two-year starting quarterback Will Barmore, along with receivers Tim O’Shea and Jimmy Ringrose, highlight the team’s losses on offense. The defense, however, will undergo the biggest transformation. Only three starters return - senior safety Matt Thompson and defensive linemen John Miller and Ryan Gavronski. The entire linebacking corps consisting of Ryan Montalvo, Ian Hall and Joe Koczera will have to be replaced. The trio finished among the team’s leading tacklers in 2017, with Hall collecting 94, Koczera 75 and Montalvo 49. Cole Brock’s and Sean Scanlon’s departures leave the Blue Knights with two holes along the defensive line. Southington will also have to find three replacements on the back end after losing Sam Thomson, Anthony Vecchio and Shaun Wagner. Kyle Messenger, Billy Carr and Angelo Plantamuro will step in at linebacker. Both Messenger and Carr were able to get some varsity experience last season. But it will be Thompson who will be relied on heavily, especially early, to oversee the defense. Despite the losses, there appears to be plenty of talent to go around. Drena, the new quarterback, figures to get a majority of the attention. It comes with the position, especially at Southington. The Blue Knights’ last three quarterbacks - Stephen Barmore, Jasen Rose and Will Barmore - each led their teams deep into the postseason with the elder Barmore and Rose winning state titles. Drena attempted eight passes last season and also saw time at receiver and tight end, catching 12 passes for 96 yards. The good news is the new signal caller will have a number of players to rely on. Southington returns four offensive linemen that all saw significant playing time last season and will have a veteran receiving corps in seniors Jamie Lamson (20 catches, 367 yards), Will Downes (24 catches, 319 yards) and Jacob Flynn (12, 140). Senior Tanner LaRosa and junior Dillon Kohl return to the backfield after going through some ups and downs in their first varsity seasons. LaRosa ran for 390 yards and nine touchdowns, while Kohl added 122 yards and a score. It might be a new-look Southington football team, but the goal hasn’t changed: win a state championship. Posted in New Britain Herald, Southington on Wednesday, 5 September 2018 21:23. Updated: Wednesday, 5 September 2018 21:29.